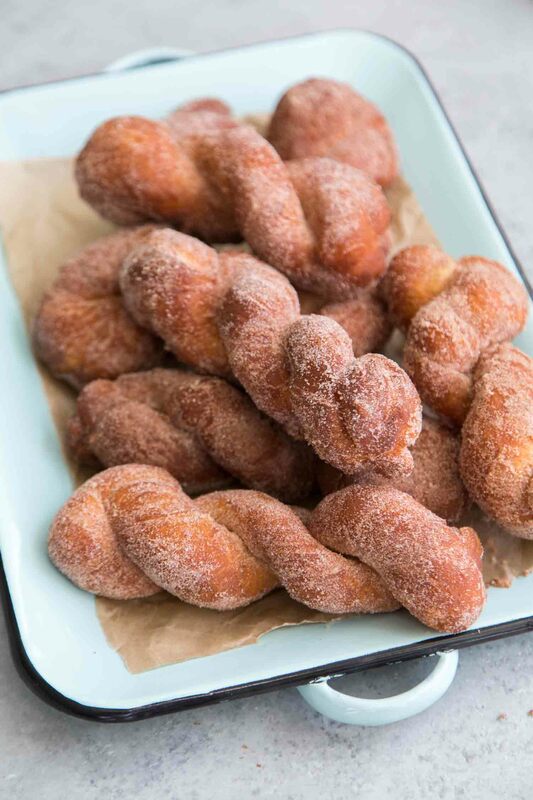 These cinnamon sugar twist doughnuts are a cross between crunchy churros and soft, fluffy beignets. Shape the dough into twists, punch out rounds, or slice them into squares. I tried several times to make churros. After three failed attempts I gave up. 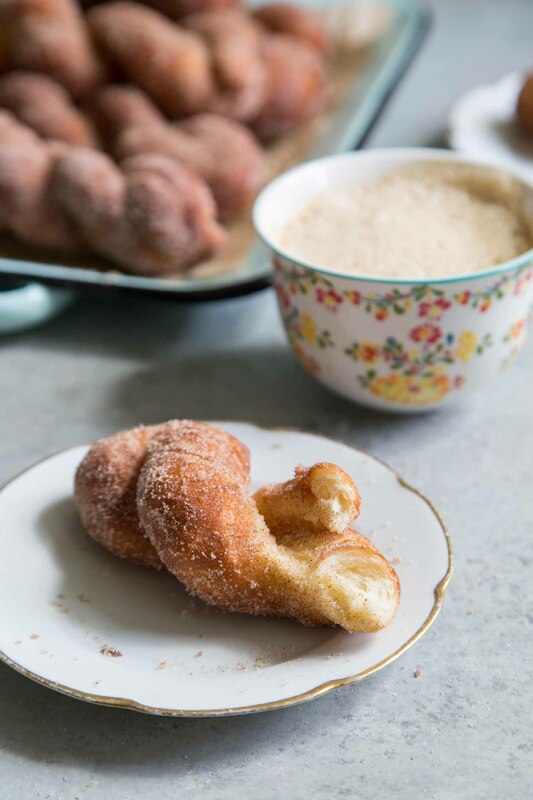 Still craving cinnamon sugar, I turned to my favorite yeast raised doughnut recipe. 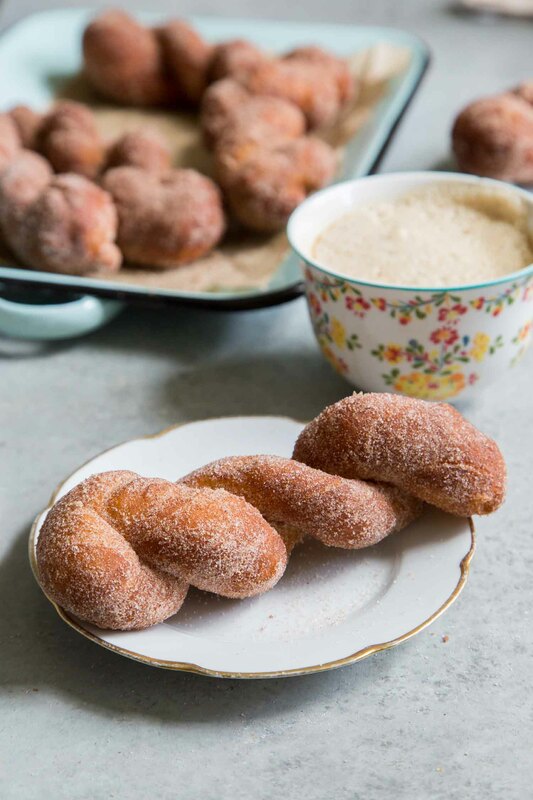 If I can’t have churros, cinnamon sugar twist doughnuts is the next best thing (if not it’s equal)! The original dough recipe yields a dozen doughnut rings and a dozen or so doughnut holes. Instead of punching out rounds, I divided the dough into 12 portions to roll out braided twists. The dough is quite simple to make. 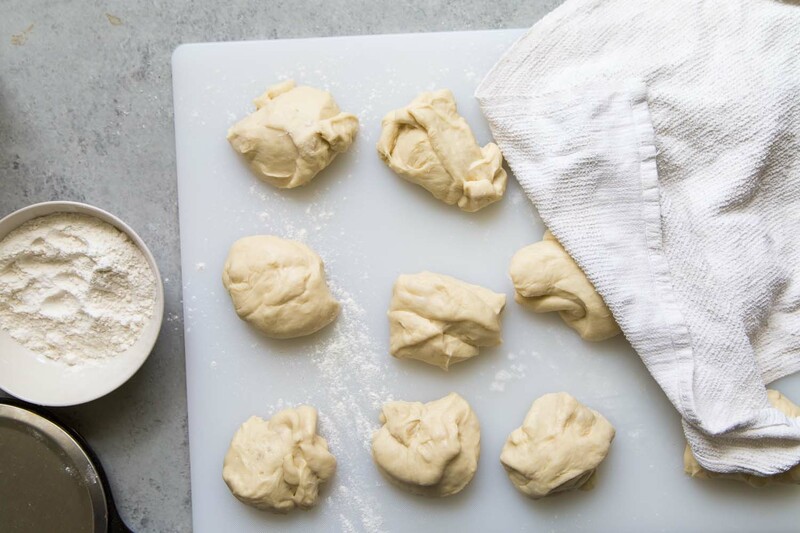 With the help of a stand mixer, kneading together the dough is a breeze. However, even without a mixer, mixing and kneading by hand is feasible. One tool I highly recommend is a digital kitchen scale. This will ensure equal portioned pieces, as well as even cooking times. Temperature affects dough. Use a kitchen thermometer to ensure the yeast is mixed with proper temperature liquids. Temperature can also affect dough rising/proofing time. Optimal temperature is in the mid-70s, around room temperature. Keep the dough covered with a kitchen towel or plastic wrap to prevent an unwanted “skin” from forming. 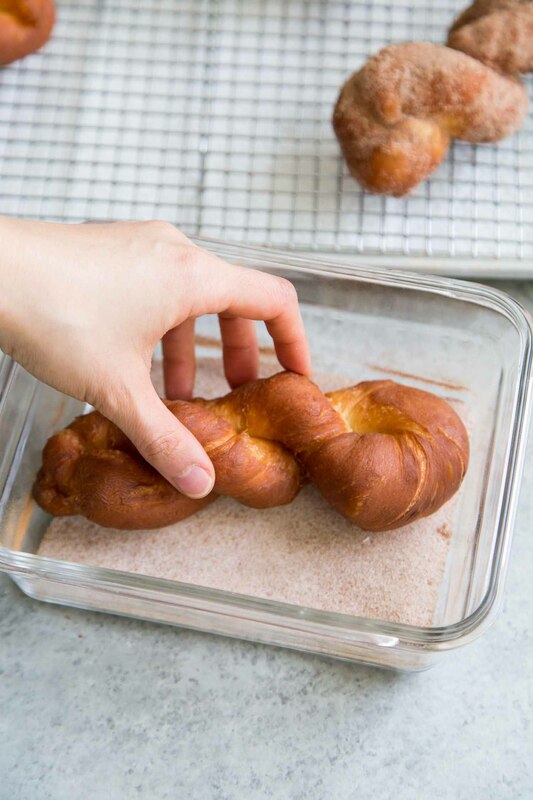 Do this when the dough is rising, as well as when you are forming the doughnut twists. Use a digital kitchen scale to divide dough equally. Equally portioned out dough pieces ensure even cooking times. These twist doughnuts fry up crispy on the outside. The exterior reminds me of Chinese stick doughnuts (youtiao). While the outside has a nice crunch, the interior of the doughnut is light, fluffy, and pillowy. The doughnut will slightly deflate with each bite, but it’ll bounce back to it’s original shape in a few seconds. Colored sanding sugar offers a nice festive touch! Pink and red for Valentine’s Day, pastels for Spring and Easter, etc. Muscovado sugar (also known as Barbados sugar) adds a dark, rich molasses flavor. Mix granulated sugar with other spices like cloves, nutmeg, star anise, etc. In the bowl of stand mixer, combine milk, yeast, and sugar. Allow mixture to sit for 5 minutes. Whisk in egg until incorporated. In a large bowl, whisk together flour and salt. Attach dough hook attachment to stand mixer. With the mixer running on low, add 1/3 of flour mixture. Once dough starts to come together, add another 1/3 of flour mixture. Add softened butter one tablespoon at a time, mixing well after each addition. At this point the dough will be sticky. Scrape down bowl as needed to ensure thorough mixing. Add remaining 1/3 of flour mixture. Transfer dough to a large greased bowl. Cover with plastic wrap or kitchen towel and allow dough to rest for 30-45 minutes at room temperature until dough has doubled in volume. Gently deflate risen dough. Working on a lightly floured surface divide dough into 12 equal parts. Loosely cover dough with kitchen towel. Working with one piece at a time, stretch and roll dough into a 14-inch stripe. Allow dough to rest for 8-10 minutes while oil heats up. Attach kitchen thermometer to a heavy bottomed sauce pot (such as Dutch oven or cast iron pan). Fill pot with 2 to 3 inches of oil. Set over medium heat until oil reaches 350°F. 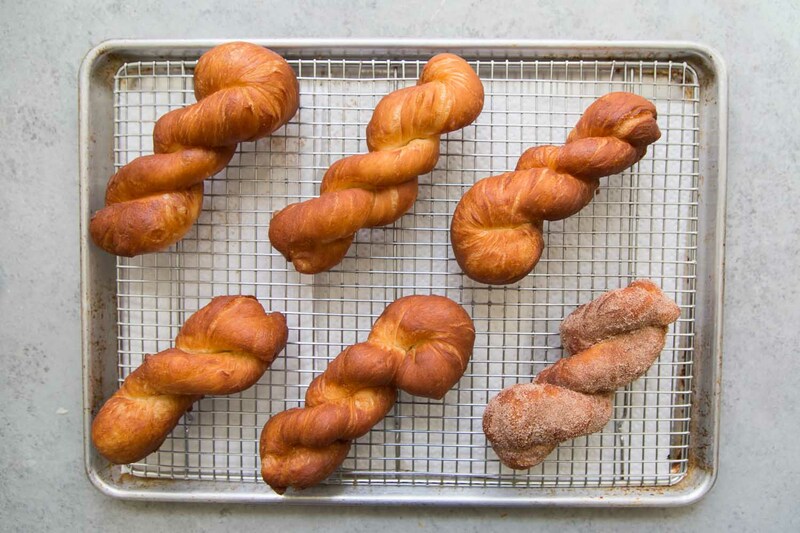 Carefully place two or three doughnut twists into hot oil. Do not overcrowd the pot. Cook for 95 seconds on each side, until golden brown. Transfer cooked doughnuts on a paper towel lined baking sheet. NOTE: Oil temperature will change as you add raw doughnuts into the pot. Monitor oil temperature using thermometer to make sure the doughnuts do not burn or undercook. Cinnamon Sugar: combine sugar and cinnamon in a shallow dish. Set aside until ready to coat cooked doughnuts. 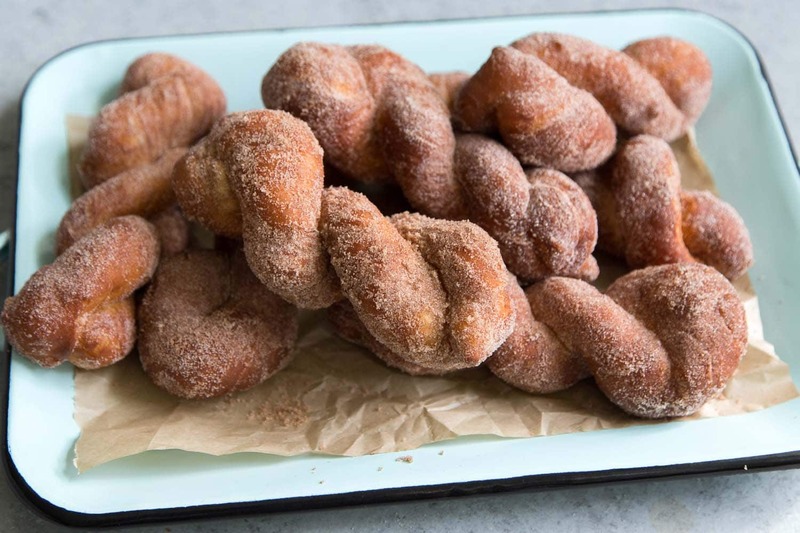 Toss warm doughnuts in cinnamon sugar coating. Enjoy immediately. These doughnuts are best eaten within a day of frying. 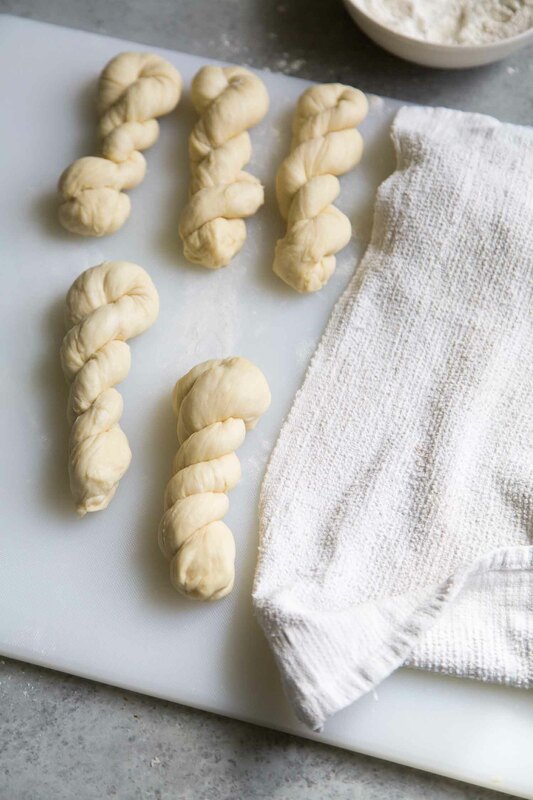 Forming twists: alternatively, you can roll dough into a 14-inch strip, fold in half, and braid together until you have at least 4 twists. The method listed in the instructions results with a tighter braid.